EUGENE — Now, women who are pregnant can get a free ultrasound while out shopping, or even picking up a sack of maple bars. 1st Way, a pro-life pregnancy resource center here, has fitted out a van with an ultrasound machine and sends trained technicians out to the community to help women see the developing life within. Daylight Donuts in Eugene is one of the businesses that welcomes the van, as does St. Vincent de Paul of Lane County and Centro Latino. Staff hope to have the van at shopping malls and other sites in the future. “It’s been a dream for several years,” says Terry Ianora, executive director of 1st Way. The van also is a place to get free pregnancy tests. A physician monitors the program. The local Knights of Columbus located a used cargo van for the project and picked it up in Medford. The customizing shop created a small medical exam room inside, including a bathroom and waiting area with a couch. Knights also serve as drivers. When the technicians are doing their work, the drivers excuse themselves for a time. The van went into operation in mid-January. Business has been slow, but advertising and word of mouth likely will increase that. About 60 percent of 1st Way’s overall visitors find out about services from the internet. 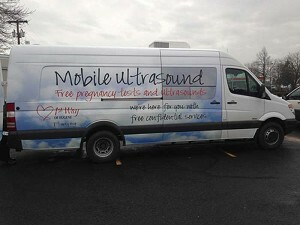 Other cities in the U.S. have mobile ultrasound units, including New York and Los Angeles. A year ago, Portland got on the list, too, with an ultrasound RV operated by the Guardian Project.